Phase-Change Material for Hot water energy storage. When compared to water, PCM materials are able to store more heat per unit volume than conventional storage materials such as water. 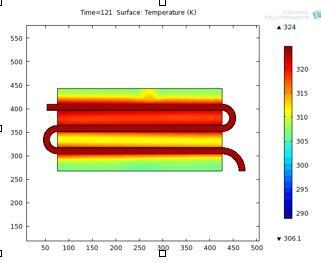 Recent calculation performed by HTT showed that PCM with 200kJ/kg Specific Heat of Fusion could store 2 times more energy than water when both are at 50°C. However, this energy capacity reveals only some of the advantages of using PCM. Phase-change materials deliver energy at a constant temperature. This means that water outlet temperature from the unit will maintain a constant temperature for the required delivery time. Water delivered from a water tank decrease in temperature over time. PCM’s higher thermal capacity per mass can be utilized to replace the water tank.